How MS Dhoni deals with his batting wingmen, Jadhav and Pandya, and just as pertinently how they deal with him, is an equally interesting evolution to observe in the months to come. 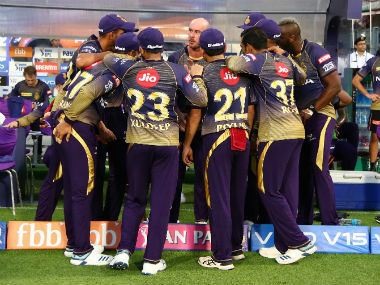 His side were in considerable disarray when Kedar Jadhav walked out to bat on Sunday afternoon in Chennai. Nathan Coulter-Nile’s late shape had proved too much for India’s top order, the Perth pacer striking three early and telling blows. With Shikhar Dhawan absent for personal reasons, the selectors had returned to Ajinkya Rahane to open, but the right-hander soon snicked off and slunk off. It’s a forlorn business being Rahane in ODIs, where he has occupied every position in the top seven except number five in his 80 games. He had recently been granted some stability and form in the West Indies, but was then promptly dropped for the following tour of Sri Lanka when Rohit Sharma — fit for the Caribbean but rested — was brought back in his place. Virat Kohli ended the Sri Lanka series with twin centuries, but at the weekend his dismissal was reminiscent of the low of his and India’s year, the Champions Trophy final defeat against Pakistan. In Chennai, Maxwell took a breathtaking catch off Coulter-Nile in almost exactly the same position Shadab Khan had taken a more routine one at The Oval off Mohammad Amir. It wasn’t to be the last time Sunday’s match at the Chepauk brought to mind India’s defeat in south London, though subsequent connections had more positive associations for the Indian captain and his side. After Manish Pandey also went tamely, teased into a diagonal-batted whimsy drive to another ball swung away by Coulter-Nile, Sharma welcomed Jadhav to the middle with the score 11 for 3. Not ideal, but the Maharashtra all-rounder has an energy to him not easily diminished by mere tricky circumstances. In his innings against England earlier this year in his home city of Pune he fizzed out to bat with the score 63-4 in the twelfth over and proceeded to chop the visitors to pieces like a pug dog wielding a rapier, scoring 120 off 76 balls as India chased down an improbable 351. 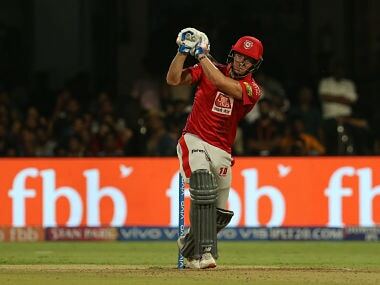 On Sunday he batted a position higher at five and arrived six overs earlier, a situation necessitating a little more circumspection, especially as Jadhav actually didn’t come into this series in blinding form. Afforded only three knocks in five matches due to the dominance of India’s batting in Sri Lanka, he failed in two, although he made 63 off 73 in the last ODI as his side picked off the home side’s dejected attack with ease to round off a 5-0 obliteration. Those victories were all too routine but here the situation, much like Jadhav’s batting, was anything but. He is relatively studious as he sets himself at the crease, but then his high back lift hovers and twitches menacingly as the bowler approaches. It then comes down in a whirl, the ball often whizzing to backward point, deliveries on even a fullish length and tightish line being dispatched there with quick-handed verve. His front foot drives are relatively orthodox and melodic, but he sometimes plays his back foot ones on the walk and even while walking backwards as he opens up the off side. For many of his shots he seems perpetually on the verge of falling over. Such are the manic pulsations within him, yet somehow it all pulls together. It is said of some players that you look up at the scoreboard and wonder how on earth they acquired their total so quickly. For Jadhav when playing with relative restraint you wonder how on earth he's still not on twenty more than he already is, such is the kinetic burst which accompanies most of his strokes. At times this high octane style is his undoing, his windmill swishes sometimes reaching their conclusion before the ball has fully reached him,. Against England in his own backyard in that 120 his pulling was bountiful. Against Australia at the Chepauk the two-paced pitch did for him as he mistimed a Stoinis bouncer to short midwicket. His departure came a ball after a non-fatal run out mix-up with Dhoni so his concentration was perhaps understandably a little shaken. There are steel girders that would have trembled in the face of the scowl his ex-captain gave him for not agreeing to a quick single. The psychology of batting with as well as against Dhoni is not to be underestimated. Jadhav went for 40 off 56, an innings he probably won't regale his grandchildren with but it was far from insignificant, played as it was against the tide of the game. As IPL audiences will know, he has power hitting in his locker and plundered four sixes of varying degrees of astonishment against England back in January, but has struck only one in his last eight ODI innings. He can fight his and his side’s way out of a corner perfectly well, as he did on Sunday, through his mix of lower risk cuts, drives and flicks. He is a hard man to pin down, his various modes of counter attack vexing to counter. 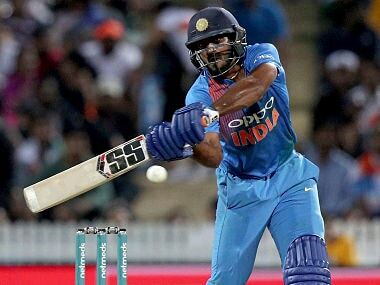 Despite Jadhav’s efforts, when Hardik Pandya came to the crease India were still in considerable disarray at 87-5. 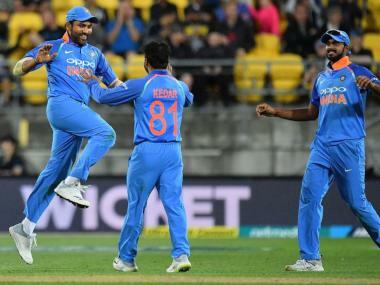 There were also other factors in play beyond the scoreboard, namely Dhoni’s presence and mood, which had unsurprisingly not been improved by the shot Jadhav miscued to get out. This icon of Indian cricket also seems to be becoming even more dogmatic as he gets older, determined to rebuild broken innings ever more through his staggering speed between the wickets, holding back his helicopter shots and relying on strike rotation rather than rotor strikes. He has always been brisk, of course, but removing the weight of captaincy from his shoulders seems to have propelled him to even greater heights of athletic prowess on the field. His hands when effecting a stumping might still be the most lightning part of his body but his feet cannot be far behind. All this appeared not an ideal scenario for Pandya, who likes to get on with things with his bat not his boots, although his 37 off 40 balls to take India home in that epic Pune chase hinted at a cool head on his 23-year-old shoulders. This may have been a situation almost as desperate as the one he found himself in at The Oval in June, when he walked out with the score 54 for 5 and played a knock of staggering violence in that final against Pakistan. But here he was walking out to join Dhoni rather than replace him. Here there was still a score to be posted not a distant fantasy to be chased, batting with a man who considers a lack of patience in such situations to be as crass as belching at a funeral. So, under Dhoni’s watchful eye, Pandya was circumspect, hitting only one boundary in his first 18 balls. At The Oval it was three in his first sixteen. No one can know if things would have come off had the Mumbai Indian tried to go big from the outset of his knock in Chennai, but his decision to hold fire certainly proved successful, and not least as it spared him the wrath of Dhoni’s killer gaze for any overly premature slugging. When he did start his assault much, much later, it was the perpetually newly-coiffured Zampa who bore the brunt, a very fine young bowler who would be even finer if he could display as many variations as he does haircuts. As was the case in the Champions Trophy final, trivialities such as turn, flight or bounce suddenly seem to become irrelevant to Pandya, himself no stranger to trendy barbers. This is not to diminish the skill of his hitting — it is far from thoughtless — merely to note that when both he and the ball are in the zone there is a certainty in his striking which must be maddening to his team mates who have previously floundered as well as the poor opposition. It isn’t particularly aesthetic. He clumps sixes rather that hits them, but there is a real purity to it, and he has now bludgeoned three consecutive maximums off four different bowlers in international cricket. Imad Wasim and Shadab Khan, Malinda Pushpakumara and Zampa the men being given both neck and headaches. Pandya went for 83 off 66, an innings he may well regale his grandchildren with, although you suspect it might not even be in his top ten come the end of what looks like being a long and stellar career. He wasn’t yet finished for the day, taking two wickets with his medium pacers amid Australia’s blamanche of an effort against spin. The first was Steve Smith, one of the most prized scalps in the world. The second was Travis Head and Pandya celebrated with a point and pose combo that had more than a hint of Usain Bolt to it. 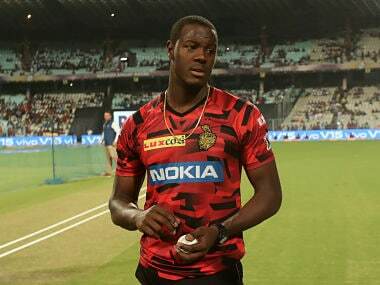 He is used to people noting what is termed his Caribbean demeanour, with his assured swagger thought reminiscent of the West Indian players he has gone toe-to-toe and bling-to-bling with in both the IPL and international arena. He might have a vat of self-confidence, but he is canny enough to know he will ultimately have more success striving for Dwayne Bravo-style slower balls than the Michael Holding-esque bouncers for which he occasionally overreaches. Despite the mutterings, Dhoni is going nowhere before the 2019 World Cup. He is a fixture in the side until he or Kohli decides otherwise, and even in the latter case his megalithic presence will be far harder to oust than Anil Kumble’s. India’s World Cup-winning captain’s own game seems to be evolving even at the age of 36, and it is still fascinating — occasionally infuriating to some — watching the manner in which he pilots difficult innings and chases. How he deals with his batting wingmen, Jadhav and Pandya, and just as pertinently how they deal with him, is an equally interesting evolution to observe in the months to come.